Copies of the document are available for review between 9:00 A.M. and 4:00 P.M. Thursday, April 18, 2019 through May 17, 2019 at the Kansas City Streetcar Authority reception desk, 600 E. Third Street, Kansas City, MO; and at the Federal Transit Administration, 901 Locust Street, Suite 404; Kansas City, MO. Copies of the EA are also available for viewing below or at the Central Library, 14 West 10th Street, Kansas City, MO 64105; and at Plaza Branch, 4801 Main Street, Kansas City, MO 64112. All comments must be submitted by Friday, May 17, 2019. 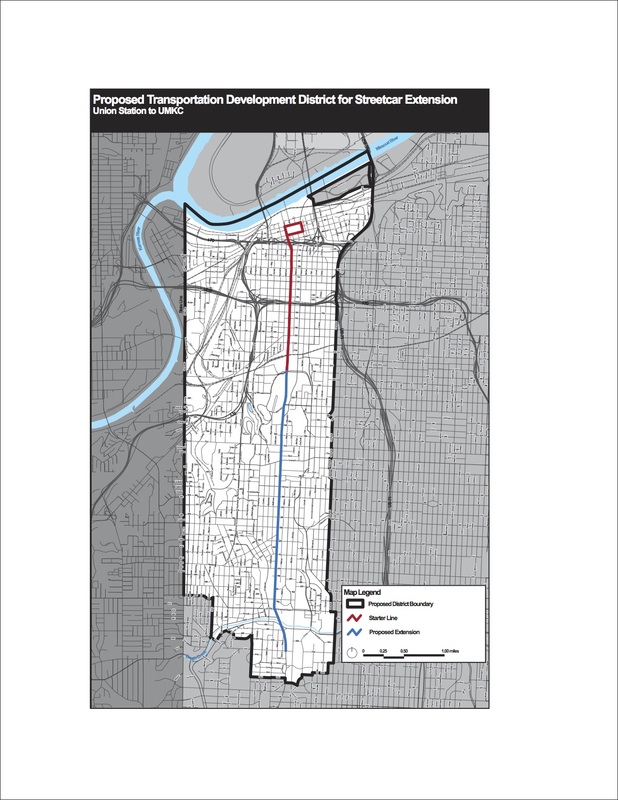 The KC Streetcar Project Team recently issued a Request for Qualifications/Proposals for Design Professional Services for the Main Street Extension. Please follow this link for more information. The work includes Project Management, Engineering and Architectural designs, drawings, calculations, reports, schedules, and cost estimates necessary to complete the Federal Transit Administration (FTA) Project Development phase in the Capital Improvement Grant (CIG) process. The work performed will be Preliminary Engineering (PE), or generally identified as the 30% design level. Actual design level completed shall be as necessary to develop Scope, Cost, Schedules and Project Management Plans detailed enough to meet FTA’s requirements for submitting a request for project “Entry into Engineering”. Interested bidders are encouraged to apply. The deadline to submit proposals is April 25, 2019 at 2:00pm. Proposals shall be sent to Darrell Everette, Procurement Manager, Procurement Services, General Services Department at 414 East 12th Street, City Hall 1st Floor, Kansas City, Missouri. The KC Streetcar Project Team is also looking for qualified firms to provide Streetcar Vehicle Design Engineering Support Services. This would be provided to the City on an as-needed, on-call basis. The initial task will be to provide management, design, and documentation support services needed to procure an expansion of the existing Kansas City Streetcar fleet. Interested bidders are encouraged to apply. The deadline to submit proposals is April 3, 2019 at 2:00pm. Proposals shall be sent to Darrell Everette, Procurement Manager, Procurement Services, General Services Department at 414 East 12th Street, City Hall 1st Floor, Kansas City, Missouri. The direct link to the RFQ/P can be found on the City’s website here: Project Number: 89022014-002. Need to catch up on the KC Streetcar Main Street Extension progress? Check out the below video for an overall review. This video is current as of March 2019. KC Streetcar Main Street Extension to UMKC from KC Streetcar on Vimeo. The KC Streetcar Main Street Extension project team held a public meeting on Thursday, February 21, 2019, from 4:30 – 6:30pm at Saint Paul’s Episcopal Church. If you missed the February 2019 public meeting, click here for the plot map of the entire Main Street Extension. 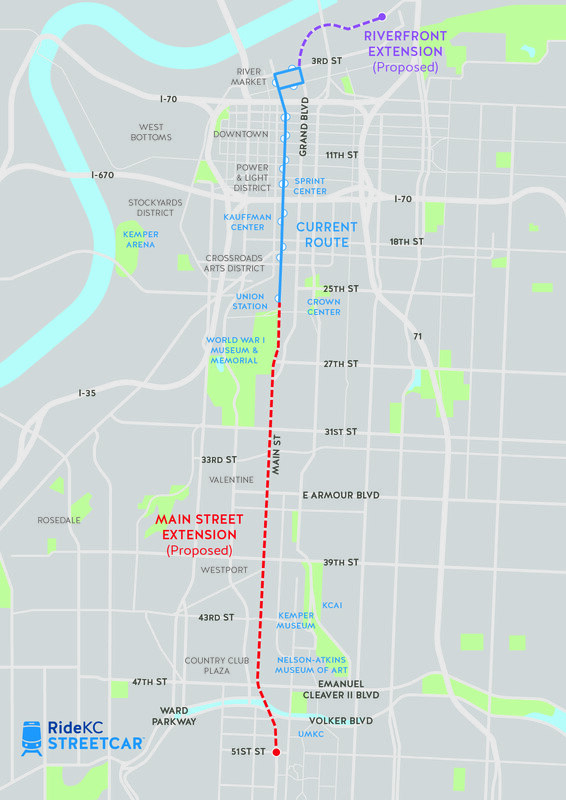 The KC Streetcar project team recently applied for federal funding for the Main Street Extension to University of Missouri-Kansas City (UMKC), marking a crucial step in moving the street extension project towards construction. Late last week, the KC Streetcar project team, consisting of the KC Streetcar Authority (KCSA), the KC Area Transportation Authority (KCATA), and the City of Kansas City, MO (KCMO), submitted the formal application to the Federal Transit Administration (FTA) for the New Starts Capital Investment Grants Program, seeking $151 million dollars in federal funding and inclusion in the federal 2020-year budget to support the estimated $316 million-dollar project. The New Starts grant program funds transit capital investments including heavy rail, commuter rail, light rail, streetcars and bus rapid transit systems. Both federal and local funding are needed to move this project into design and construction. Local funding was approved by the voters in the establishment of the Main Street Rail Transportation Development District (TDD). The KC Streetcar project team, consisting of the KC Streetcar Authority (KCSA), the KC Area Transportation Authority (KCATA), the City of Kansas City, MO (KCMO), and the consultant team led by HDR, Inc., has continued to advance the project planning for the Main Street Extension to UMKC, including work to refine streetcar stop locations, track alignments, and coordinated transit connections. Based on the technical analyses, public feedback, and detailed evaluation of the merits of each lane placement, or track alignment (outside-running vs. center-running), the project team will be advancing the outside-running alternative into the next phase of detailed project design. More information about the process can be found here. 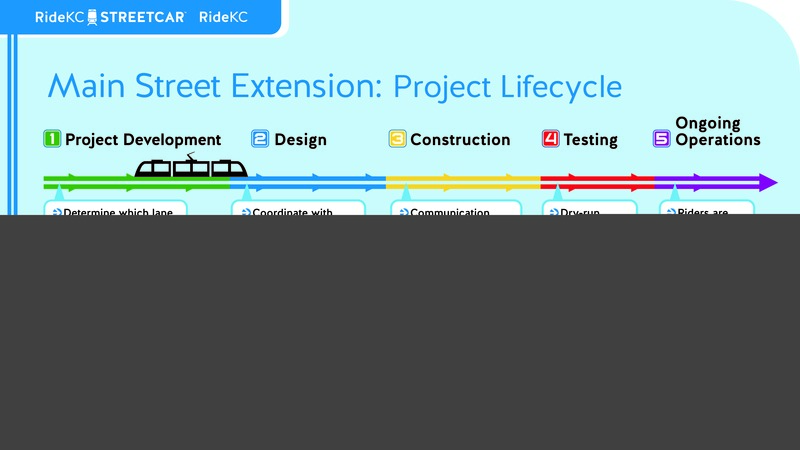 Click here for the full KC Streetcar Main Street Extension Track Alignment Analysis. 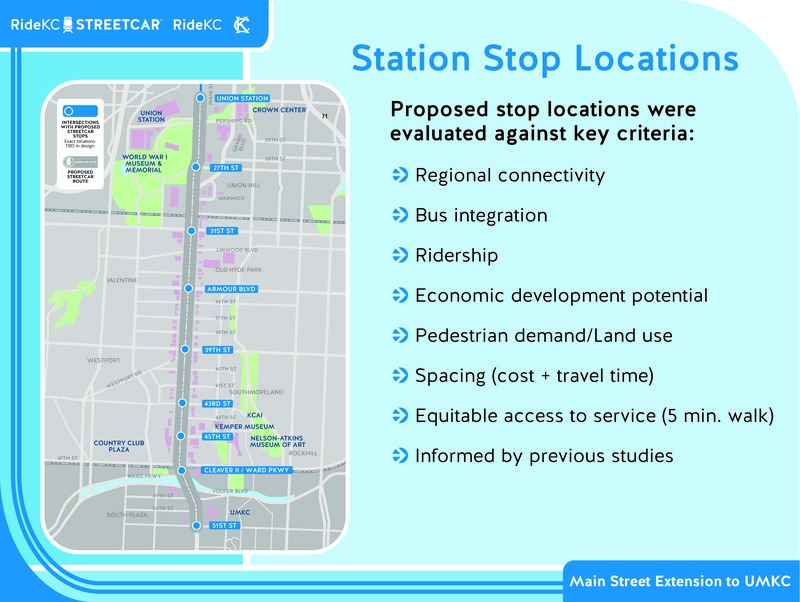 KC Streetcar project team refines proposed stop locations (click for more info). Notarized Ballots are due June 12, 2018. 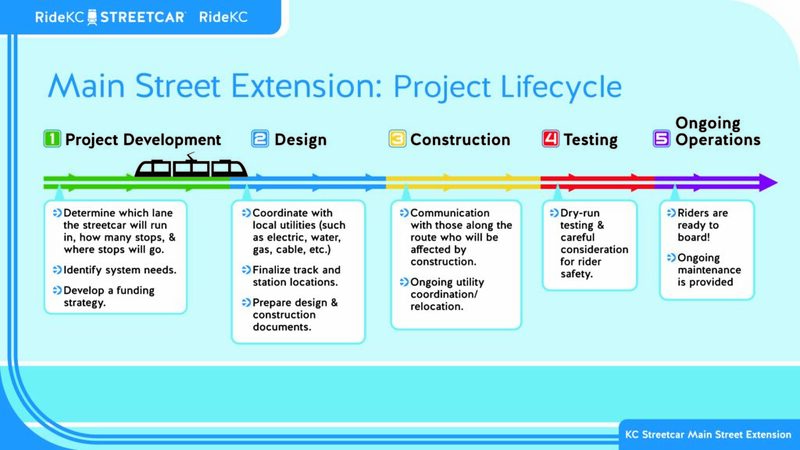 The KC Streetcar team (KCSA, KCMO and KCATA), along with consultants led by HDR, are currently in the project development phase of the Main Street KC Streetcar Extension project. In the coming weeks and months, there will be numerous opportunities for the public to participate in the preliminary design and needs of this extension. Stay connected with the project here as well as on our social media sites. Read the official news release about the FTA’s approval to enter into the Project Development Phase. 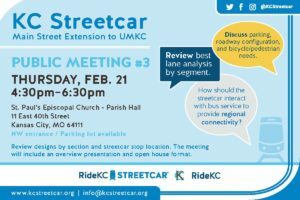 Why are we planning to extend the KC Streetcar line south towards UMKC? 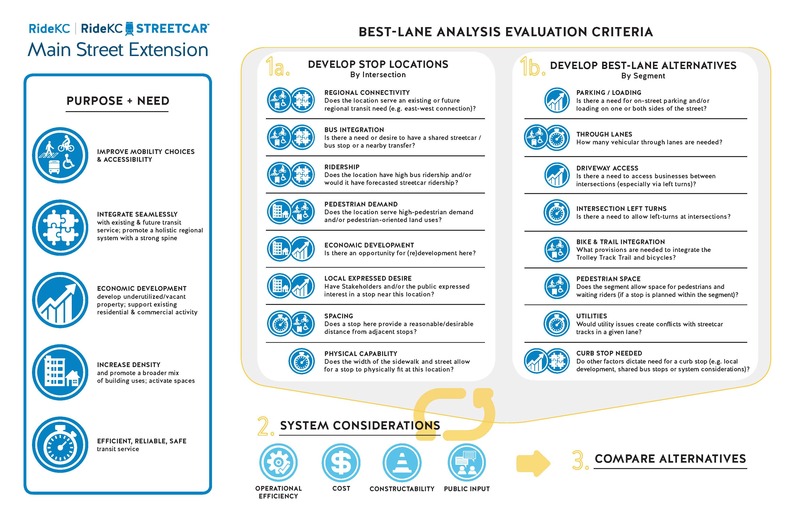 The KC Streetcar Authority (KCSA), in coordination with the Kansas City Area Transportation Authority (KCATA), selected the team led by HDR to conduct a KC Streetcar Main Street Extension study to assess multi- modal transportation needs. The KC Streetcar Southern Extension Technical Services will build upon the downtown streetcar service and will support work required to further develop and advance the southern extension towards the University of Missouri, Kansas City (UMKC). In addition to HDR serving as the project lead, the team consists of members from Burns & McDonnell, HNTB, Trekk Design Group, Hg Consult, Parson + Associates, VSM Engineering and Architectural & Historical Research. The Main Street Extension study will focus on following: − Data collection (utilities, current conditions, etc.) − Refining alignment details (curb-running / center-running) − Station stop locations and terminus configuration − Plan for coordinated regional transit service integration and improvement − Updated cost estimates − Initiation of federal funding process The KCSA has developed a coordinated project development process with key project partners such as the City of Kansas City, Missouri; the KC Area Transportation Authority (KCATA) and the Mid-America Regional Council (MARC). This approach is inclusive of key project stakeholders in Kansas City and on the proposed route such as property owners, residents, neighborhood groups, community organizations, etc. The Main Street extension proposal advances implementation of the strongest streetcar expansion corridor & long-standing regional transit vision as indicated in Kansas City Region’s Long-Range Transit Vision, “Smart Moves.” This extension proposal also builds on the success of the downtown streetcar starter-line, while further strengthening that route and extending benefits to a larger population and job centers. Additional information about the Main Street Streetcar Extension can be found on the KC Regional Transit Alliance website. A fact sheet about the proposed Transportation Development District (TDD) that will extend the KC Streetcar to UMKC and help fund the operations and maintenance of the KC Streetcar, can be found here: Main Street Streetcar Extension.